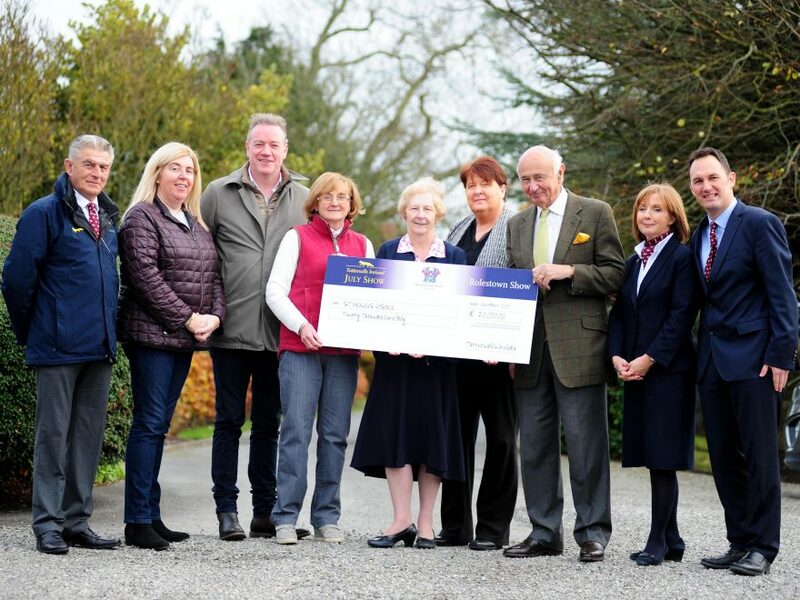 The committee of the Tattersalls Ireland July Show in association with the Rolestown Show and Ward Union Hunt made a donation of €20,000 to Sr. Margaret Cashman and Dee Kinane of St Francis Hospice at the Tattersalls Ireland November Sale this week. The funds were raised from the proceeds of the 2017 July Show which was held during the summer and saw equestrian competitors flood through the gates to take part in one of Ireland’s elite equestrian sporting events. The donation is the biggest to date, and the Show has now donated over €50,000 to the Hospice over the last four years. St Francis Hospice, located in Raheny and more locally in Blanchardstown, provides specialist palliative care service for the people of North Dublin City, County and surrounding areas. In 2016 alone, they supported more than 1,500 patients and their families along with specialist palliative care to more than 1,200 people in their homes. In addition, more than 600 people were admitted to their Inpatient Units for symptom management and end of life care. “I am delighted that the Tattersalls Ireland July Show has generated a donation of €20,000 in 2017 and I am very proud of the tireless work of the entire Show Committee who through their combined efforts ensure that the Show is a success and can contribute to the Hospice in this way. I would like to take this opportunity to thank everyone who supported the Show and helped raise such a substantial amount of money this year. St Francis Hospice is right on our doorstep and to be able to support their invaluable cause in some small way is gratifying for all involved.